Here at Duo Beauty, we have a solution for all your skin care problems. GLYCOLIC ACID PEEL - Refining and smoothing by ungluing and dislodging dead skin cells, reducing the signs of sun damage, acne, pigmentation and ingrown hairs. VITAGE - Advanced antioxidant preparations are used in a relaxing treatment to defend the skin from environmental damage ( EPF ). MINI MICRO - A non surgical facial procedure that tones facial muscles, using pads for lifting the neck, cheek and jaw areas effectively. Combined with a micro current it refines fine lines and wrinkles and puffiness around the eye area. An effective anti ageing treatment for all skin types. REVIDERM MICRODERMABRASION - Microdermabrasion is a skin resurfacing treatment designed to remove the outer layer of skin to reveal younger, tighter and more radiant skin underneath. It is superbly effective by mechanically exfoliating the skin with micro - crystals. It also stimulates new cells and collagen. TH. STONE THERAPY MASSAGE - A beautiful relaxing massage using the warmth of heated stones to soothe and relax muscles at a deeper level. Well recommended, especially for cold winter days. HOPI EAR CANDLES - An Indian relaxation ceremony that helps calm the mind, soothes the head and ears. It helps improve hearing and blocked ears, cold and flu, popping in the ears and much more. Increasing number of people of Western culture have enjoyed and benefited from the pleasant effects of this age old ceremony. 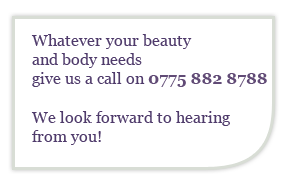 ELECTROLYSIS - Treatment for Thread Veins, Skin Tags, sebaceous Warts and Cysts and permanent hair removal. Full body massage - one hour to relive aching muscles, helping to disperse toxins and tension leaving you feeling fully refreshed and revitalised.